I’ve been a mover lately. I used to be a shaker, which was some kind of fun. Shaker. That brings to mind shaking the earth. Or shaking the dice. Shaking with fear. Fear of shaking. But now I’m just a mover, and funny how that works out. If you were moving and shaking at the same time, lord knows what would happen. Mercy! Suddenly there’s lots of stuff to move! All human possessions fall into three categories, which I am now going to invent: Stuff, Junk, and No Way I’m Tossing That. Moving is a good time to pare down your mountain of Stuff. It’s always going to be a mountain, no matter how much you throw away, so be ruthless. The long-term goal, I guess, is to whittle your possessions down to a knapsack and a handful of rice, so you can walk the earth and compose haiku. That’s what we’re all working toward, right? I wish more presidential candidates would discuss this issue. It interests me a great deal. Junk is astonishing and infuriating. Junk is what happens to Stuff when its shelf life expires, I guess. One man’s Stuff is another man’s Junk. Junk is a grim reminder we will all someday leave behind a mountain of Capital J with which others must deal. And there was sadness upon the hills. Have you been to a landfill lately? I have. I’m pretty sure the landfill in my county can be seen from outer space. “Landfill” suggests a big hole, but I didn’t see one. The landfill over on Highway 43 is, well, a mountain. It’s next to a big creek. During heavy rains, the creek floods the adjoining pasture, where cows graze. The hard rain falls. Drink your milk. Junk is maddening. And toxic. Sure, I contributed to the problem. But one trip was enough. I have become conscious of The Junk Problem. I have entered a new era of Junk Awareness, and it is plenty frightening. Junk is Public Enemy Number One! Down with Junk! My perspective is limited. I’m just one man, rearranging one family’s Junk. But multiply this by 300 million and boy does it get ugly quick. Cf. 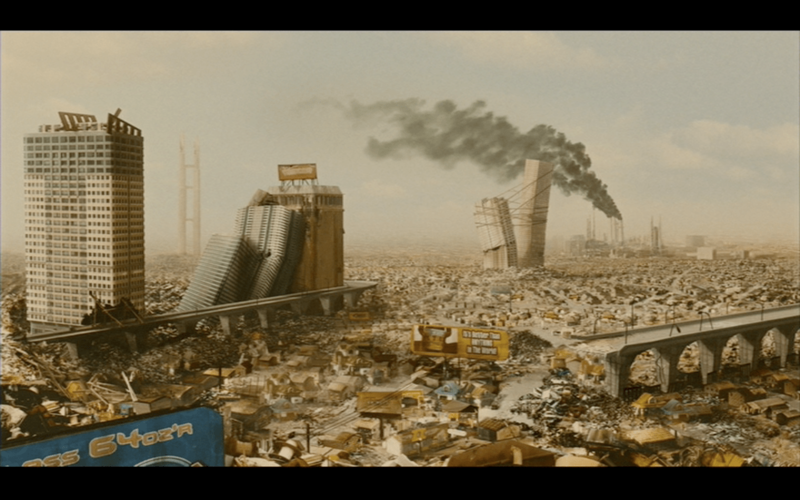 Mike Judge’s garbage-scapes in Idiocracy (a wonderful and underrated comedy with Luke Wilson and Maya Rudolph). I have climbed the Mountain of Junk. This is not something you ever want to do. The day I went to the landfill it had been raining and the road to the top, where you must dump your Junk, was a steep incline of muddy ruts. There was a guy in an orange vest standing next to a pickup truck. He would have been directing traffic, I guess, but there wasn’t any traffic except me. I stepped out to survey the road. The smell was enough to knock over any number of large land mammals. The guy in the orange vest watched me without expression. He wore no mask, no oxygen tank. He was just hanging out, like the Mountain of Junk was the Garden of Eden. “You gotta get a runnin’ start,” he said, pointing at the final ramp. Several vehicles had run off the ramp and become mired at odd angles in pits of radioactive goo. So that’s your movie. Stunt driving on the Mountain of Junk. Also a pretty good adrenalin fix, in case you’re wondering. What happened to the others, the ones who had been marooned there? Had they been sacrificed to some awful olfactory god? What sort of gigantic, revenge-crazed mutant was growing inside the Mountain of Junk? What was cooking under those tons and tons of Premium Crap? Hey, it’s my baby blanket! I totally remember this blanket! No way I’m tossing that. John Hicks encourages you to extend the bagel of friendship daily. Wonderful post on a topic I’m keen to discuss further. My idea has always been to pare down all Stuff to a group of 100 items. Of course that can be vexing. Is a set of golf clubs ONE thing, or is it 14? Do I need 2 wedges? Really? does anyone hear me when I make my well thought out comments? i guess not. You need only 1 wedge. I need 2 wedges. One to hit poorly and one to throw in the pond. I have several terrible ideas I’d like to post on b2l2.com. I don’t want to go NEAR Fridays, because Mr. Hicks dominates that day like Billy Graham did Sundays. But if I made an occasional general interest video of reasonable length, could I implore Mr. Hicks to share it on this page? I promise that nothing would make sense, or be useful. It’d be 2 and half minutes you’d never get back again. But I promise to use fades and backing music. And I promise that I will reveal ways in which we could all be better humans. i sent a link to mr. hicks. if it’s any good, go ahead and post it. if not, not to worry.